• Seed potato producers in Victoria and South Australia have market access to Indonesia. • The protocol was signed at a bilateral forum in Melbourne yesterday. • Only Western Australian seed potatoes previously had access, and Victoria and South Australia are major seed potato producers. More than 300 seed potato farmers across South Australia and Victoria will be celebrating after today’s breakthrough in securing new market access to Indonesia. Minister for Agriculture and Water Resources, David Littleproud, said delivering this market access would provide opportunities for seed potato farmers to now compete in premium markets with the best produce the world has to offer. “Agricultural trade is a priority for the Coalition Government and we are delivering, not just sitting around like couch potatoes on this issue,” Minister Littleproud said. “The export protocol has been on the boil for a while and today we finally got it over the line - this will take an industry with a current production value of $520.3 million, to new heights. “Today’s signing paves the way for trade in seed potatoes from Victoria and South Australia to commence as soon as possible, whenever farmers are ready. “This is a fantastic result for farmers in these two states—as major seed potato producers—and builds on current seed potato access for Western Australia. “Australia and Indonesia have a strong bilateral partnership, with two-way trade worth $4.28 billion in 2016-17 in agriculture alone. The Coalition Government has secured free-trade agreements with three significant export markets—Japan, Korea and China—and just signed the Peru-Australia Free Trade Agreement and recently concluded the Trans-Pacific Partnership Agreement. • Through the Agricultural Competitiveness White Paper, we are investing $30.8 million to break down technical barriers to trade, and appointed five new agricultural counsellors in key small markets. • In the agriculture portfolio since January 2016, we have had 64 key market access gains or restorations, along with 57 key market access improvements or actions to maintain market access. In an Australian first, broccoli direct from the Lockyer Valley has been exported to Seoul in South Korea this week. South Korea is Asia’s fifth largest economy and imports more than 70% of its food and agricultural products. The Korea-Australia Free Trade Agreement (KAFTA) which started in December 2014, reduces trade and investment barriers and helps level the playing field for Australian exporters competing with those from the USA, Europe, Chile and ASEAN countries, who also benefit from trade deals with Korea. “This is really exciting for us” said Michael Sippel, Chairman of Lockyer Valley Growers. “Currently only 1% of vegetable imports into South Korea come from Australia and consumer tastes and demand for luxury and high-quality food products are increasing” added Michael. Until recently, confusion in Australia existed about whether broccoli and other leafy green vegetables had market access into South Korea. Korean authorities recently confirmed access and the first shipment of Australian Broccoli landed in Seoul this week following a direct flight from Brisbane. “Our vegetable producers in Queensland are gaining an international reputation as producers of high-quality clean, green and safe vegetables. Vegetable producers, especially those based in the Lockyer Valley where a lot of leafy-green vegetables are grown, are excited about the export potential for their produce to South Korea” Michael said. Other leafy-green vegetables that have export potential in South Korea include lettuce, cauliflower, spinach, kale, Chinese cabbage and brussells sprouts. Lockyer Valley Growers received funding from Austrade as part of the Free Trade Agreement Training Provider Grant and are implementing the project in conjunction with Bundaberg Fruit and Vegetable Growers, Bowen-Gumlu Growers Association and the Queensland Department of Agriculture and Fisheries. "Every year, Hainan sweet potatoes are planted in August. The crop is ready for harvest around the Spring Festival, which is considerably earlier than sweet potatoes from Northern China. The supply generally last until the middle of June. Our early availability is giving us a competitive advantage compared to other production regions," explains Mr. Wu Fengyao from the Dongfang Fengzaibao Sweet Potato Farmers Cooperative. "The cooperative was founded in 2009. We have registered our brand under the name Gandi Yuan. We grow sweet potatoes on 65 hectares. We will add an additional 35 hectares this summer. 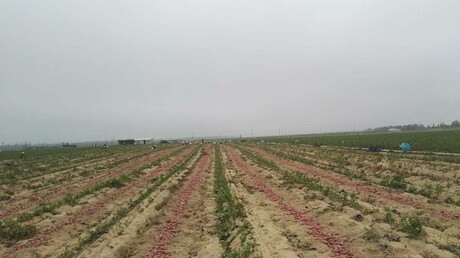 Half of these bases will be used for planting Qingxiang sweet potatoes, a Chinese variety, and the other half will be used for Japanese sweet potatoes." "At this stage, our sweet potatoes are mainly sold through the traditional way of selling to domestic cities, such as Shanghai city, Jiangsu and Zhejiang province. We use a combination of organic manure and organic fertilizers. This year we plan to build our own packaging factory. We have no in-house transportation services and we cooperate with external logistics companies. " The long, cold spring in Morocco and the disappointing soft fruit harvest in Tasmania and Atherton Tableland weren't enough to depress the results of the Costa Group. The Australian multinational noted a net profit which was 26.3% higher than last year. The turnover over the financial year rose by 10.2% and reached 1 billion Australian dollars. The remaining profit was 76.7 million Australian dollars. The company is active in various segments and has cultivation locations in Australia, Morocco and China. Morocco had a long and cold spring this year, which meant the season started eight weeks late. The harvest concentrated towards the end of the season. As a result of this, the contribution of African Blue, part of the Costa Group, was below expectations. The soft fruit harvest in both Tasmania and Atherton Tableland was disappointing, which limited the advantages of the off season prices. Within the soft fruit category the company is expanding with cultivations in Morocco, China and Australia. The citrus on the other hand presented well, with an excellent start to 2018. Of the 300 hectares in Riverland, 201 hectares were planted in June, of which 157 hectares citrus and 44 hectares avocado. Tomatoes and mushrooms performed well with results above expectations. There was an investment in Monarta farm, a cultivation company of mushrooms, among others. This expansion is on schedule. An investment in 10 hectares of greenhouses for snacking tomatoes has been announced for tomatoes. The greenhouse is to come into production from May 2020. Besides this there was investment in the nursery capacity and the packaging facilities within the group. Costa Group is investing in the avocado cultivation as a fifth pillar of the company. In the last 18 months 6 companies were taken over, including Koci Farm (FNQ).